I’m back!! Sorry for my absence. I’ve had a lot going on recently (business-wise) and was feeling a little un-inspired in the home decor department. I’m feeling rejuvenated and ready to share some fun upcoming projects with you! 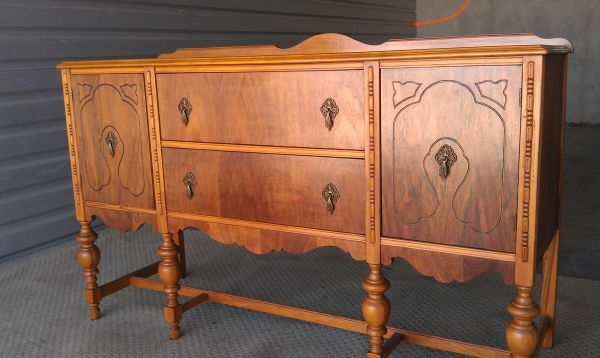 Which brings me to my latest project..
After about a year of searching Craigslist for an antique buffet/sideboard (apparently I am kind of picky) I finally found the perfect piece! 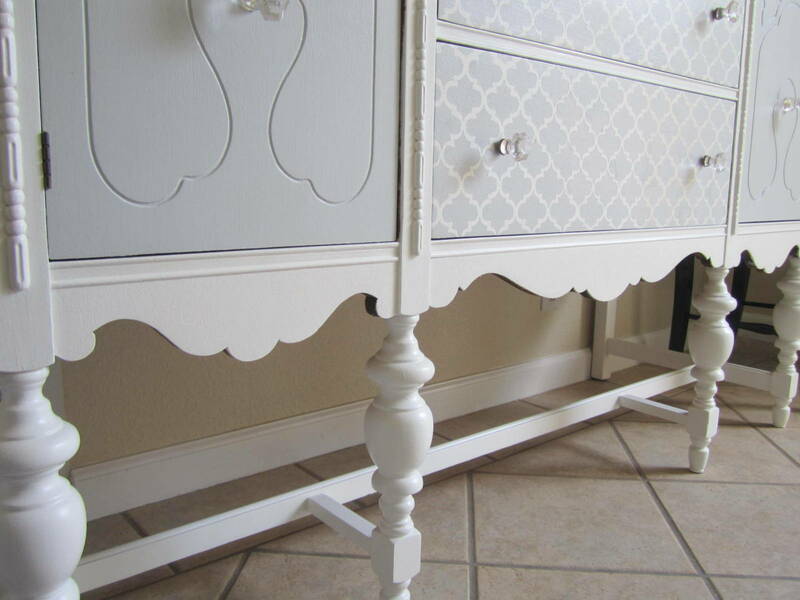 It has all the intricate details I was after – stunning turned legs, scalloped wood & tons of gorgeous wood detailing. 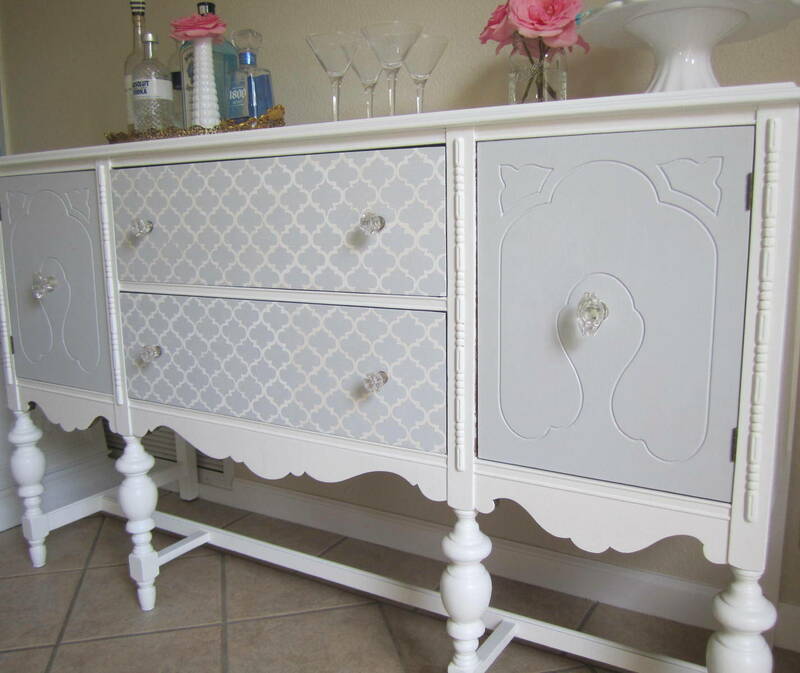 Step 1 – Remove hardware & doors. 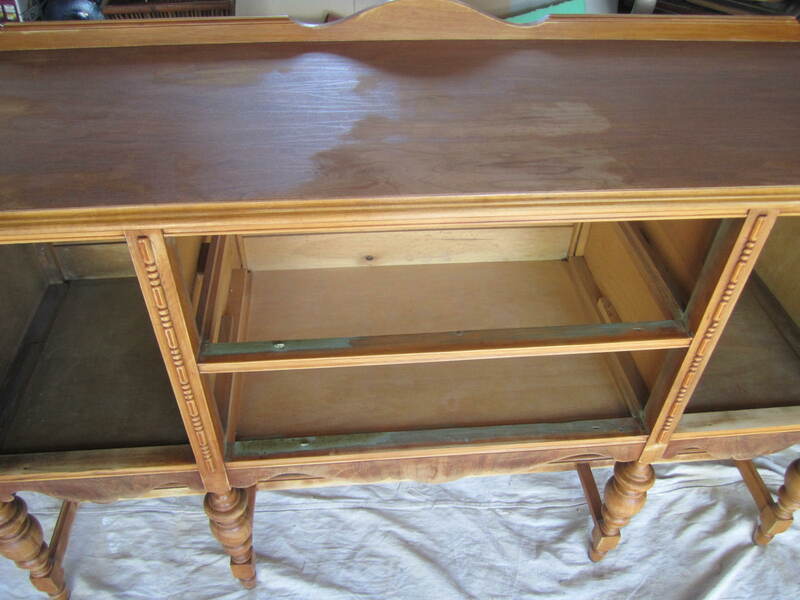 Sand down the wood to remove shine & any scratch marks – I used 80 grit sand paper for this. I had to sand the legs by hand (UGH). PS. Yes I know my garage looks like a junk yard. We need to have a garage sale, don’t judge! 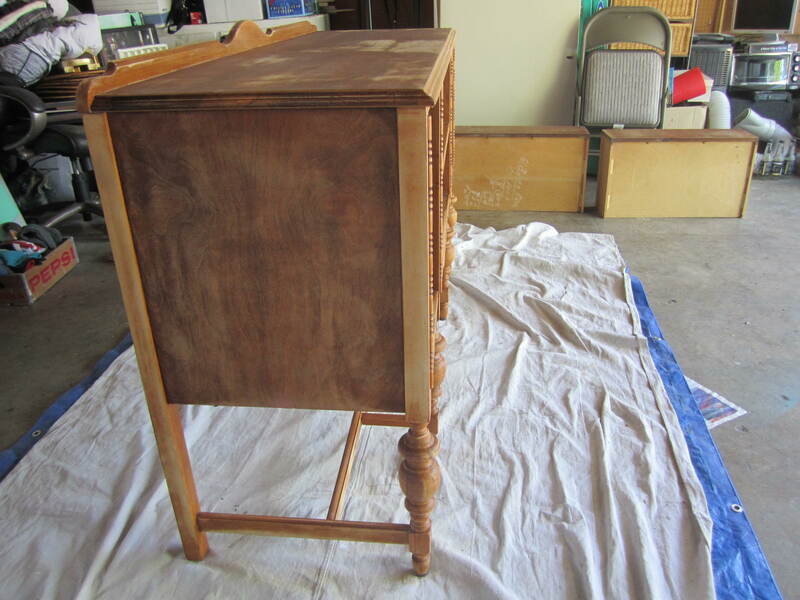 Step 2 – Vacuum sanding dust then wipe down entire piece with damp cloth. 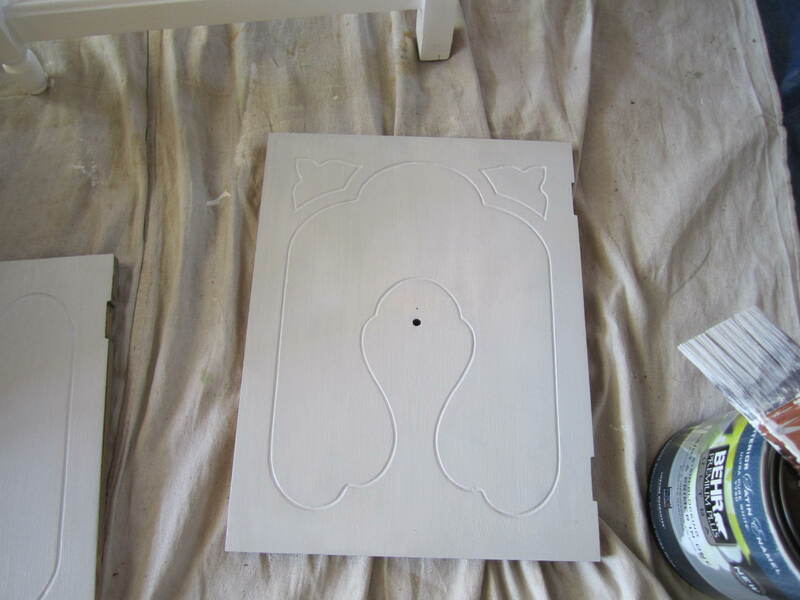 Step 3 – Paint time! In both paints I bought the primer & paint all in one, since I really hate priming. Using the all in one paint worked great. 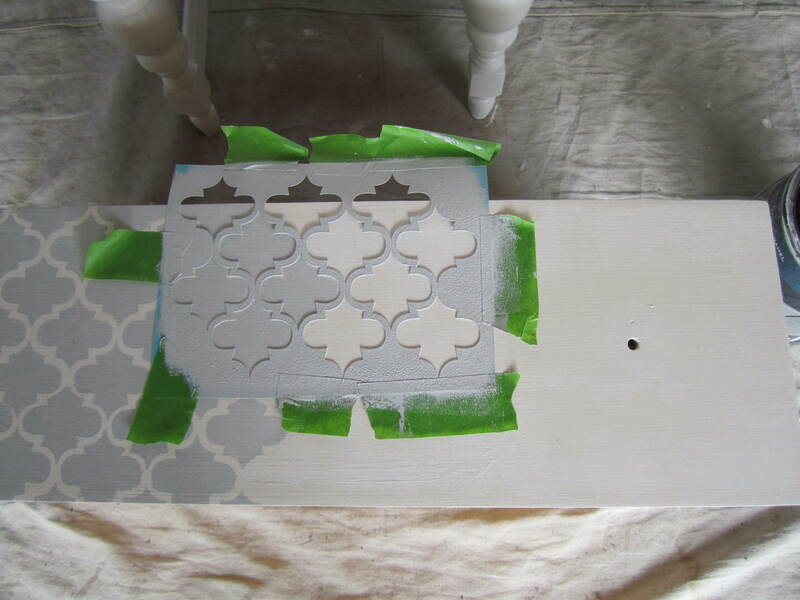 Step 4 – Stenciling. 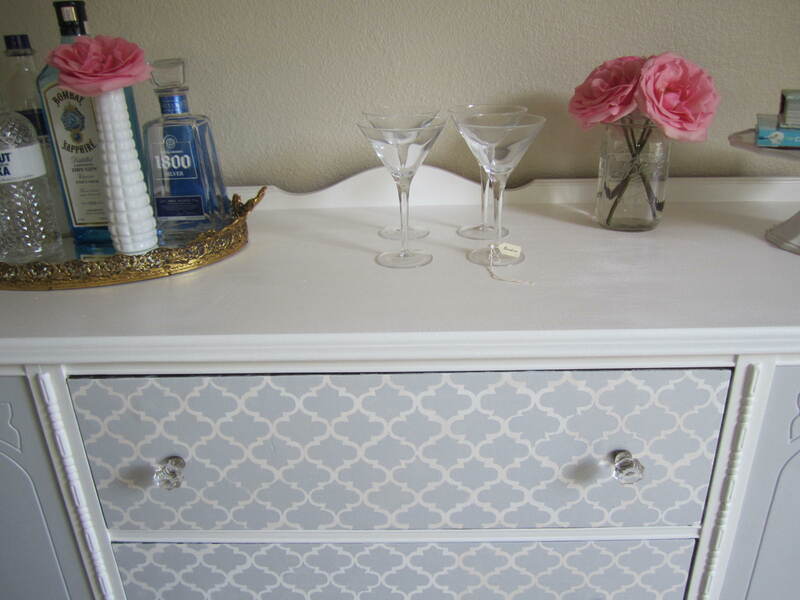 I decided to use the quaterfoil stencil from the Martha Stewart stencil pack. I was a little tricky at first to get the hang of it. 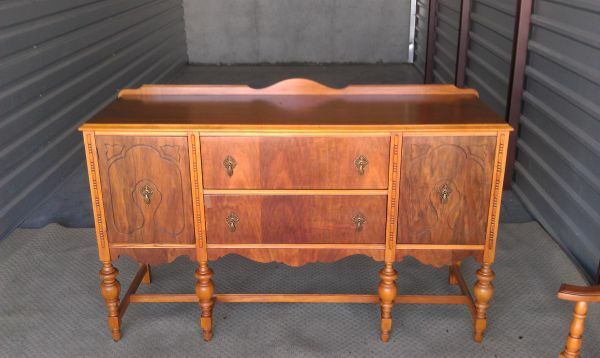 The second drawer was definitely better than my first, but I don’t really mind. Tape down your stencil, making sure it’s straight. 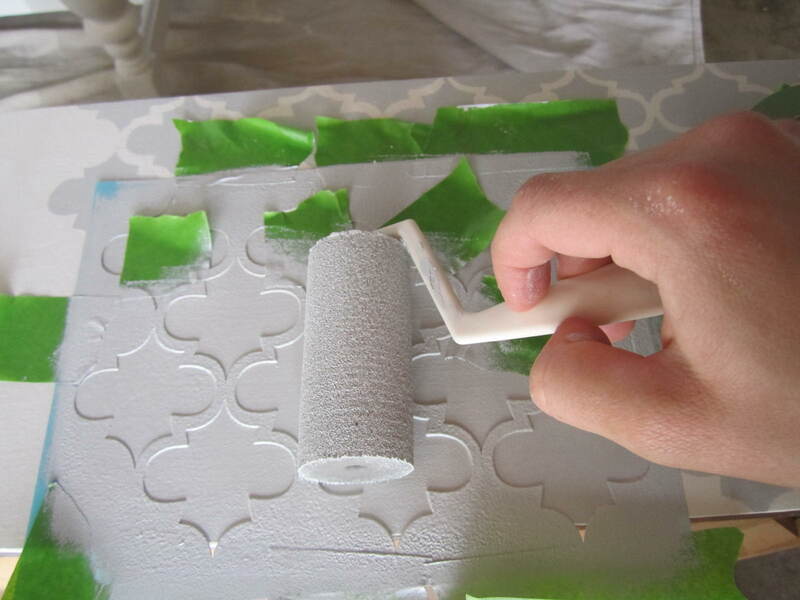 Only use a small amount of paint on your sponge roller, and gently roll over the stencil. 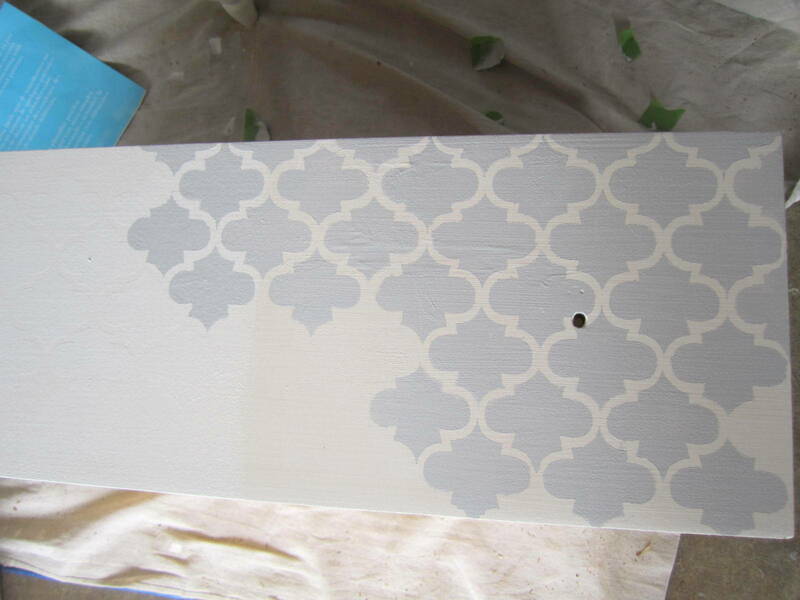 If you use too much paint on your roller, it will seep under the stencil and then design doesn’t come out so pretty. 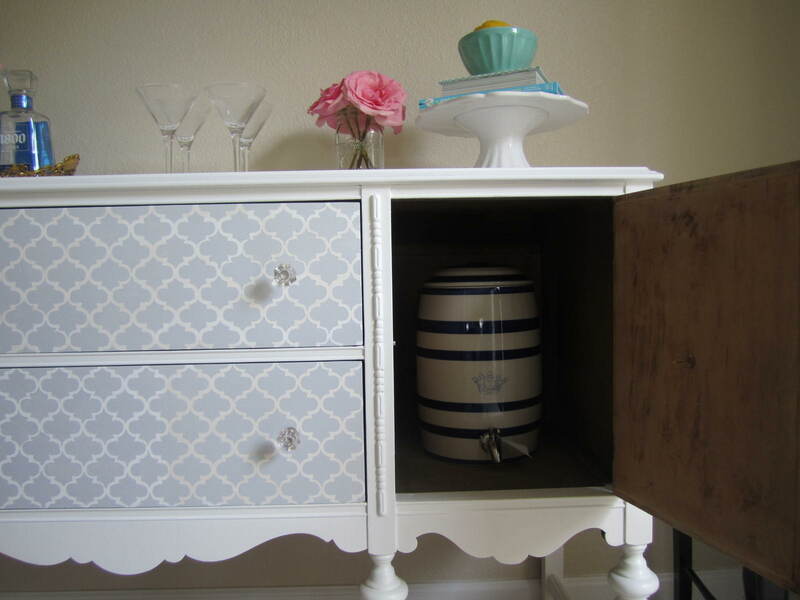 Step 5 – Install pretty new hardware & you’re done! We finally have extra storage! 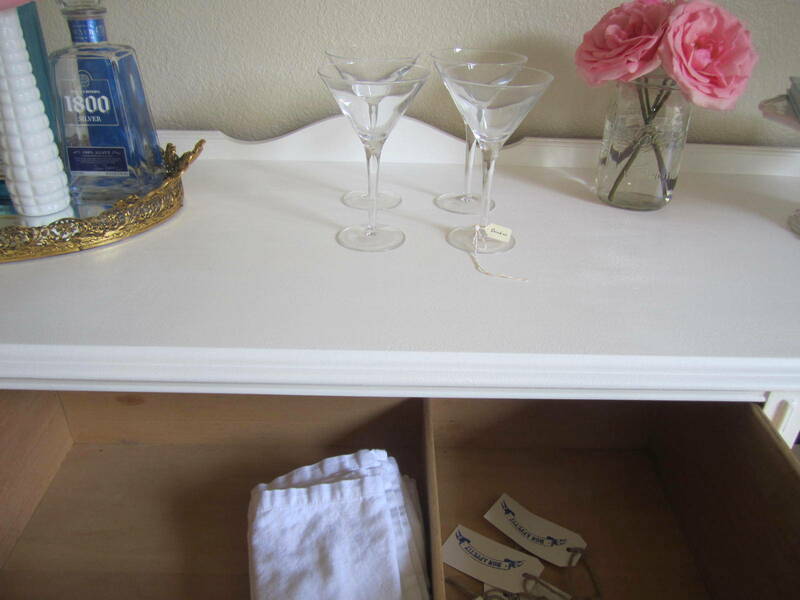 This weekend Clay & I are going to Ikea to get these floating shelves to go above the buffet. I still need a spot to store all my wine glasses & pitchers, so I think the shelves will work perf. Can’t wait to see what it looks like. By the way, do you think I should paint our dining table?? 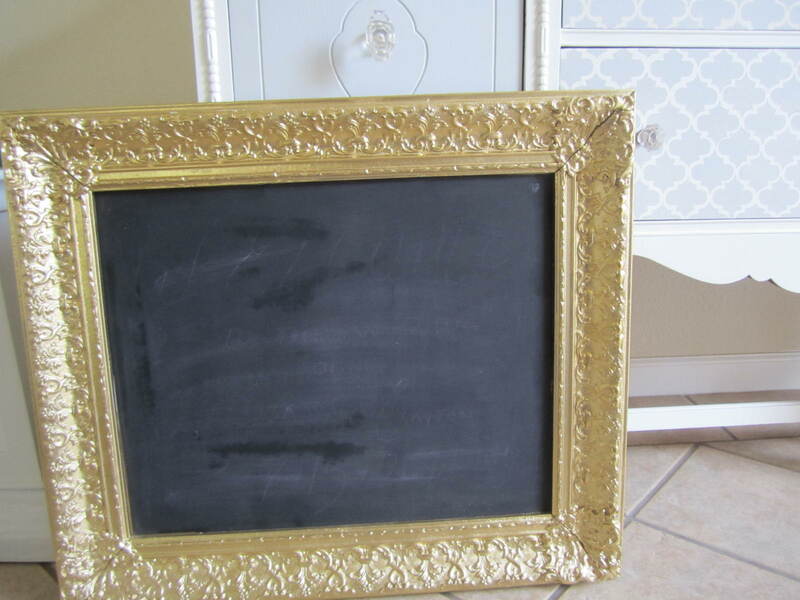 It seems so dark now..
Oh and we are also going to finally hang this lovely gold chalkboard above the buffet too. Love it girl!! Came out so gorgeous! PS Don’t paint your kitchen table! 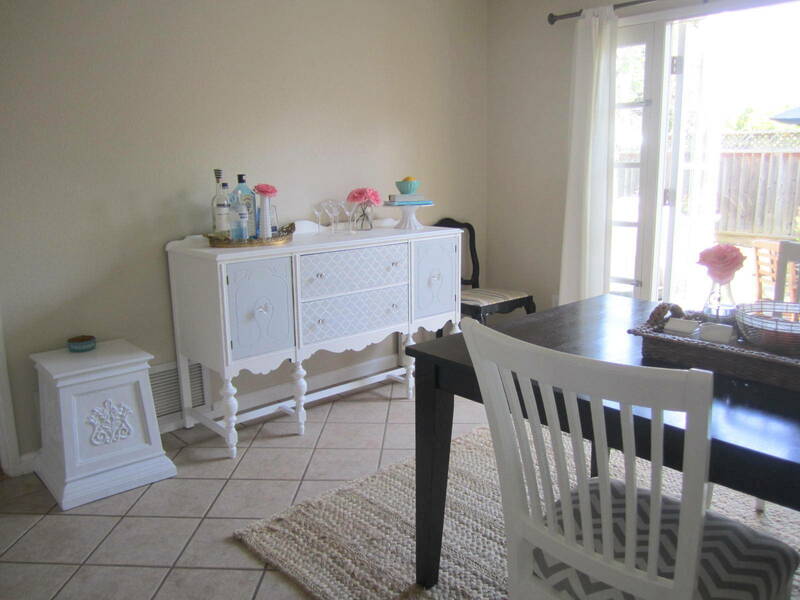 I like the combination of dark and light furniture… I think it’ll be too much painted stuff if you paint it. Just sayin..
You really did an incredible job baby!! What a transformation. You worked so hard on the stenciling too! Well done. Well done you!! 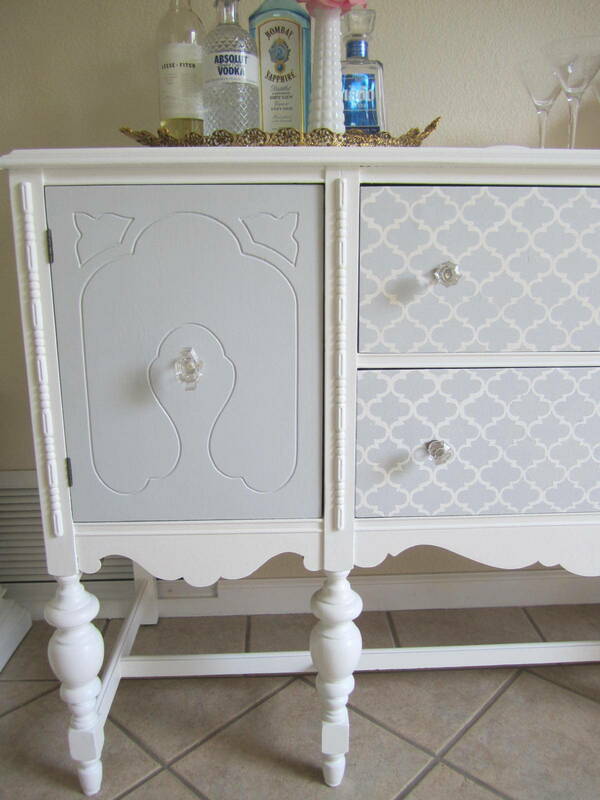 Love the stenciling and the little glass knobs. Good job!! 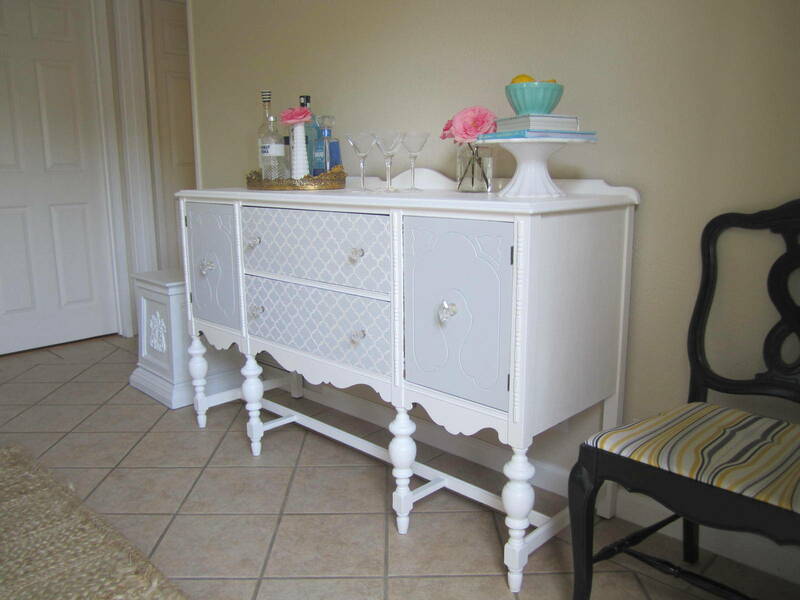 I love this idea and have an almost identical piece of furniture that we’ve been needing inspiration for. Question:did you use any sealant or anything after painting. thanks! 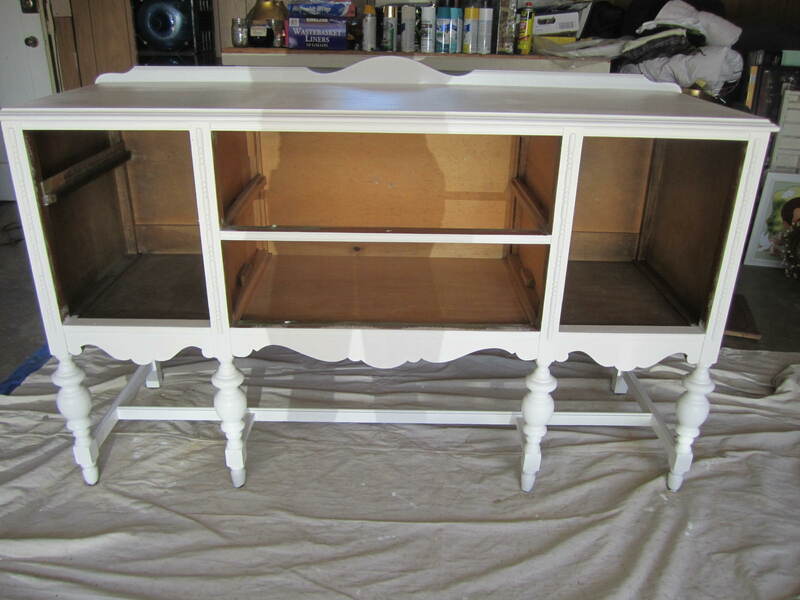 Alicia, I have not yet applied a sealant to the buffet, but I definitely reccomend it. Otherwise you’ll have scuff marks. Thanks for reading my post! Absolutely LOVE this idea! 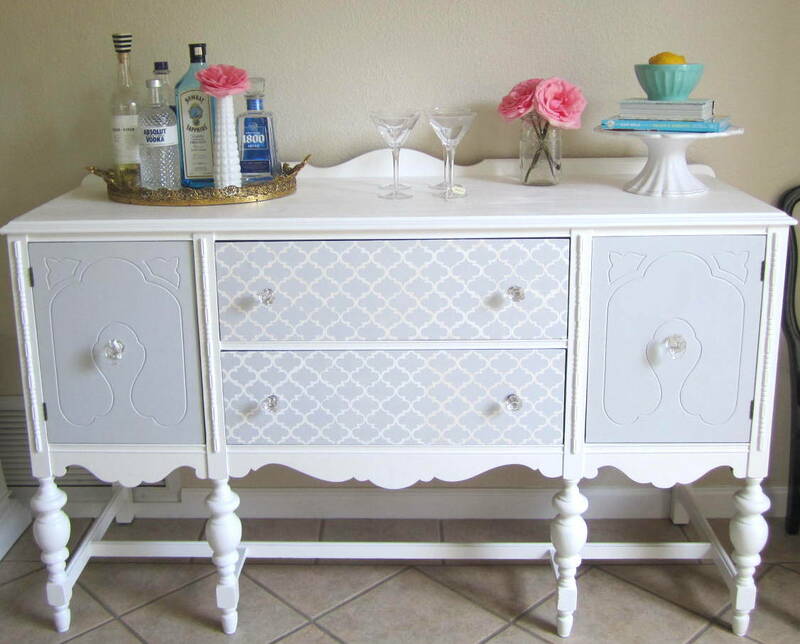 I have a gorgeous antique vanity i just scored for less than $100 bucks on craigslist and i’ve been looking for ideas on how to re-vamp it. 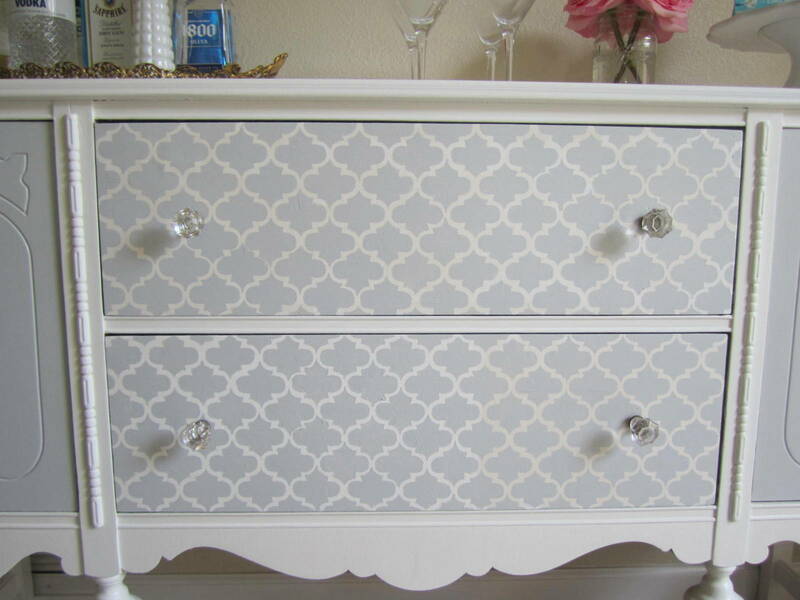 Def gonna do the stencil on the drawers and add new hardware. 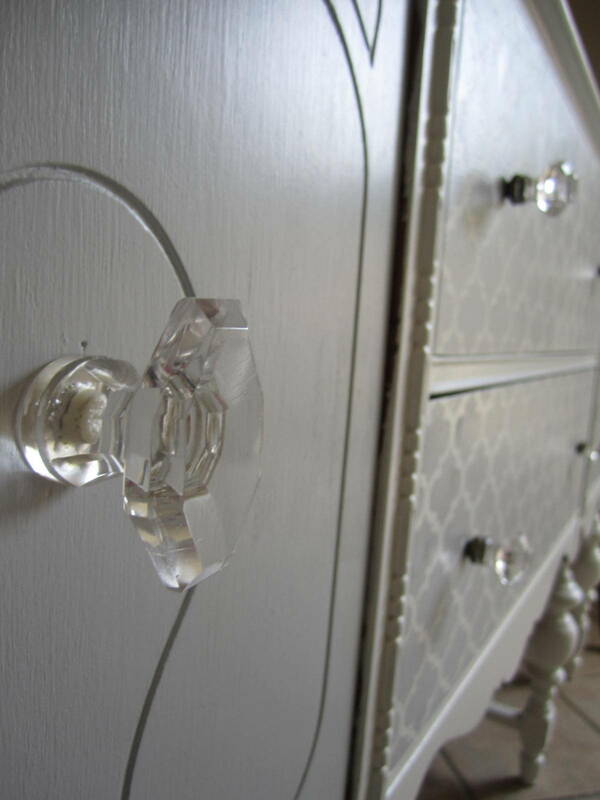 I was thinking a very light grey/antique purple paint combo with pewter hardware.